Katie Neiman, 28, lives in Brighton, East Sussex, and is a PR officer. Six years ago, she began to suffer from trichotillomania, a condition that gives her an uncontrollable urge to pull out her hair. 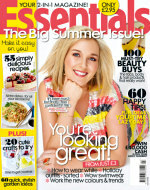 Now she’s made the cover of Essentials magazine and doesn’t she look great! Katie Neiman, 28, lives in Brighton, East Sussex, and is a PR officer. Six years ago, she began to suffer from trichotillomania, a condition that gives her an uncontrollable urge to pull out her hair. 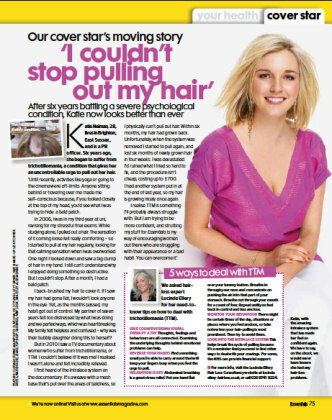 We asked hairloss expert Lucinda Ellery for her need-to-know tips on how to deal with trichotillomania (TTM). GIVE COGNITIVE BEHAVIOURAL THERAPY A TRY - Thoughts, feelings and behaviours are all connected. Examining the underlying thoughts behind emotional problems can help. REVERSE YOUR HABITS - Find something small you’re able to carry around that will keep your fingers busy when you feel the urge to pull. RELAXATION IS KEY - Abdominal breathing is a great stress relief. Put one hand flat over your tummy button. Breathe in through your nose and concentrate on pushing the air into that part of your stomach. Breathe out through your mouth for a count of four. Repeat until you feel back in control and less anxious. MONITOR YOUR BEHAVIOUR - There might be certain times of the day, situations or places where you feel anxious, so take note when your hair-pulling is most prominent. Then try to avoid them. LOOK INTO THE INTRALACE SYSTEM - This helps break the cycle of pulling because it’s a reminder that you need to find other ways to deal with your cravings. For some, the NHS can provide financial support. For more info, visit the Lucinda Ellery Hair Loss Consultancy website at www.lucindaellery-hairloss.co.uk, or call 020 8741 8224.